At the turn of the century Corsican music has taken a new course. Long rooted in the past, it has now taken on a new dimension with new influences. This synthesis has best been achieved by L'Alba. Structured around a polyphonic base, Alba’s music has freed itself from the rules and recreated new ones, using sounds from India, Maghreb, Spain, and other Mediterranean countries. 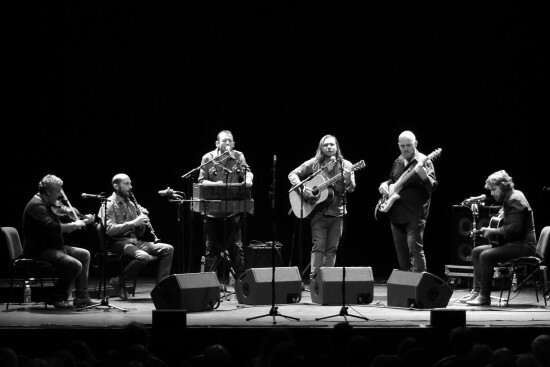 In this emblematic Corsican band, the voices of Sébastien Lafarge, Cecce Guironnet, Ghjuvan Francescu Mattei, Jean-François Vega and Laurent Barbolosi mingle with acoustic guitars, harmonium, clarinets, flute, violin, and Eric Ferrari's subtle fretless bass. L'Alba's music is characterized by its Mediterranean sounds, its voices deeply rooted in tradition and its set of eclectic instruments. The attention paid to composition and arrangement gives their polyphonic songs a spirit of their own. The singing musicians of L'Alba like to say their Corsican musical tradition is not set in stone, but on the contrary on movement, alive and ever evolving. In recent years, the band has surrounded itself with an increasingly large collective around its core. Exceptionally talented musicians have joined the group and have become involved in their musical universe, like the Malagasy accordionist Régis Gizavo (deceased in July 2017) whose enthusiasm to participate in this adventure was very inspiring. The Indian harmonium, bass and guitars form the base of LM'Alba's music, while the violin and wind instruments soloists adapt to their phrasing the characteristic melismas of ancient polyphonic singing. At each concert, L'Alba offers you an invitation to travel; the listener is always drawn to other countries, as the variations are so diverse and the musical palette wide. During this trip, the singing tour consists mainly of creations accompanied by some traditional pieces sung a cappella in trio, true to ancestral agropastoral practices.